The whole Fablesverse is one that I truly do adore and love reading through and the opening issue to this series definitely captured my attention, especially since it didn’t even really have any of what you’d called the fairest in it for more than a panel or two. 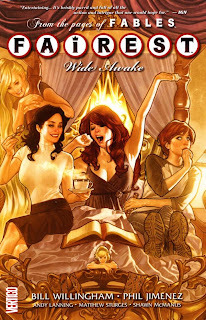 Thankfully, between the slick writing of Bill Willingham and the gorgeous art from Phil Jimenez, Fairest is able to pull it all off beautifully and give us a first volume that’s filled with stories, action, beauties and some great twists and turns that helps to build the larger lore, even as it comes off of quite a lot of existing material. Fairest is actually in a bit of a difficult spot at first as it deals with some of the fallout from the end of the great war that ran through the Fables series. In this, we’re introduced to Ali Baba as he continues to do what he now does best in that thieving is his main focus. Fortunately or unfortunately for him, he’s thought that he found what he needs to score big in finding a magic lamp/bottle, but it turns out to just be a bottle imp inside named Jonah. And Jonah’s not the type to do wishes since that’s beyond his power. But what he does have is a lot of information gathering and knowledge skills, something that was highly useful during the war, but now he’s ended up stuck in Ali Baba’s service since he’s claimed the bottle. It’s an awkward relationship to be sure, especially since Jonah is all about stories and has a lot of modern American slang about him due to that being his field of study during the war. But he’s also a conniving little imp that’s looking out for himself, something that you can say of anyone, but definitely more so of those that are magically restricted to being in service to others once freed. Jonah’s story may not seem like the main driver of the book, but it really is as he’s setting things in motion that will serve him the best. The first being that he sets Ali Baba up to acquire some real wealth in the midst of a goblin camp, which turns out to have two beautiful women that are magically asleep. True Love’s kiss and all is what’s needed to wake them and he’s more than game to do it, though they’re not quite the treasure he expected or really wanted. There’s a neat trick to this early stage that sets up a lot of things, but the main thrust is that he awakens not only Briar Rose, who served in a big way during the war against the enemy of Fabletown, but also the Snow Queen that had fallen with her during Rose’s particular attack. Suffice to say, there is no love lost between the two and their sleep time likely hasn’t changed that. Which makes their post-revival period quite awkward, since the Snow Queen intends vengeance on her, has little care for Ali Baba and is only staved off by the quick work of Jonah as he gets all of them captured by the Snow Queen for several weeks. The structure is a little odd at times when it comes to the passage of time, but it allows for a leisurely experience in a way as Jonah begins to regal the Snow Queen with stories, something that we know from her past is what she truly lives for most of the time, before her being drawn into service of Gepetto in the war. Though some little nuggets are brought out here and there, the main story that we see told to her is that of Briar Rose herself, showing what happened to her as a newborn baby that caused so many of her problems in the years going on from there, which in turn offers us some of her history in a fresh and new light. I’ve always liked Rose from the main series and what we knew of her, but this tweaks the angle just slightly and really expand son it in a great way. Her past is also what’s pretty important in the present, though the Snow Queen has little real interest in it. Revealing how the various Fairy Godmothers imbued her with so many special abilities, we also see the truth about how the slighted fairy, Hadeon the Destroyer, forced her into the situation and placed the real curse on Rose when she was but a babe. This expands on it all well and is a common refrain in the story that Jonah tells. And as we know from a lot of powerful magics in this universe, the more you name someone, the more they become aware of it. And Hadeon has not gotten nicer over the centuries, nor does she have anything positive to say about the Snow Queen with how she gave herself over to Gepetto’s service. It’s like seeing two very powerful and key people finally meet in full and go at it with all they have. It’s not played out fully on the page, but the moments are strong and it sets the tone well as we see just what Hadeon is capable of. The first six issues of the book does a great job of telling the story that involves these characters, though as said, it feels more like Jonah’s story and a sendoff tale for Rose. But even as that goes on, everyone has strong stories throughout it and it’s very much an ensemble piece which helps. Bill Willingham continues to come across as someone who can write dialogue and scenes in this world with ease, providing it all with a great flow and engaging characters. And it’s all brought to more life in a fantastic way through Phil Jimenez’s artwork, which often feels like every panel should be a poster that deserves to be on a wall. The artwork in the Fables universe has always been great and varied, but Jimenez was the ideal person to kick off this series with and how he brings it all together. Be it men or women, everyone looks great and really has some striking moments while never feeling like it’s pure fan service or overt sexual poses. Fairest had me intrigued with the first issue, but in reading the first story arc in full here it becomes apparent just how engaging and fascinating the storyline is. Rose may be the weaker of characters here overall in terms of story, but there’s a lot of exploration of her whole True Love’s angle that’s well done. Everyone has a storyline of importance here and they all blend together well into a narrative that compels you to move to the next page quickly, but with artwork that makes you linger over it as long as you can. With the conclusion of this arc, we also get a one shot story that’s fun, a Beauty and the Beast piece taking place in the 40′s, which shows that there should be some good standalone works in this series as well. There’s a lot to love here and even if future volumes pale in comparison, this is a must own piece right here.